Fitness bands are relatively accurate when it comes to recording step counts, running mileage, and even bike rides, but finding a waterproof activity tracker that can keep up in the pool is a tall order. The original Speedo Misfit Shine, released last year, was designed to count laps, no matter the stroke style, up to 50 meters underwater. Now the two companies are back with a second-gen version of the popular swim tracker, the appropriately named Speedo Shine 2. The $120 Speedo Shine 2, now available to preorder, doesn’t look all that different from its predecessor. It’s slightly thinner but retains the same aluminum coin-sized face, which can be clipped to a swimsuit or snapped inside a plastic band you wear on your wrist. It has the same swim lap-tracking capabilities, sleep-monitoring function, and 6-month battery life thanks to a coin cell battery. The second-gen Shine’s upgraded internals make it a more powerful fitness tracker than the first version. The new model has a countdown swim timer which will vibrate when your workout is complete thanks to a new built-in vibration motor. Like the new Misfit Ray, the Speedo Shine 2 uses multicolored lights and subtle taps to communicate with you, like with call and text notifications. You can also see your daily activity progress as the 12 lights around the face flash, or use the lights to tell time. 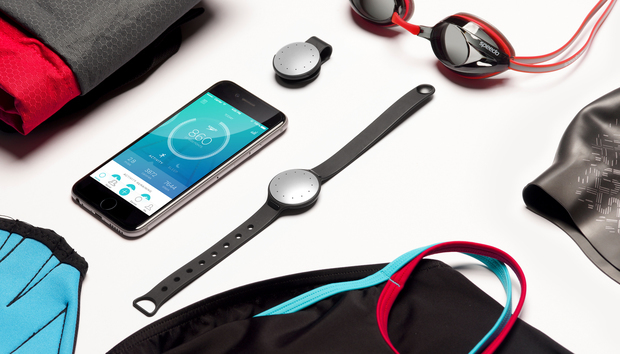 The tracker is compatible with both Misfit’s app and Speedo’s swim-tracking app. It’s also integrated with Misfit’s Link app, which lets you turn your tracker into a trigger for other activities, like taking a selfie or controlling your smart home appliances. Connected home integration is an interesting feature—a selling point that few other activity bands have. The Misfit Speedo Shine 2 works with both Misfit’s app and the Speedo Fit app. Perhaps more interesting than the launch of a new swim tracker is the added swim-tracking features coming to the Misfit Shine 2 and Misfit Ray, thanks to a $10 paid firmware upgrade rolling out in July. The Shine 2 and Ray are both water-resistant up to 50 meters, like the Speedo Shine 2, but don’t have the algorithmically enhanced lap-tracking technology that comes with the paid upgrade. The update brings the new model’s features to the two existing trackers, so serious swimmers who already own the Shine 2 and Ray don’t have to shell out to replace their devices. The Speedo Shine 2 will start shipping in 2–3 weeks. The upgrade will be available to Shine 2 and Ray owners next month.